I previously blogged about the release of the SC7020, which is part of the “odd number refresh” that has now added the SC5020. By this, I mean that it appears the even numbered SC platforms (SCv2000, SC4020, SC8000) will be refreshed via odd numbered platforms, of which we now have details on 3 of them: SC5020, SC7020, and SC9000. 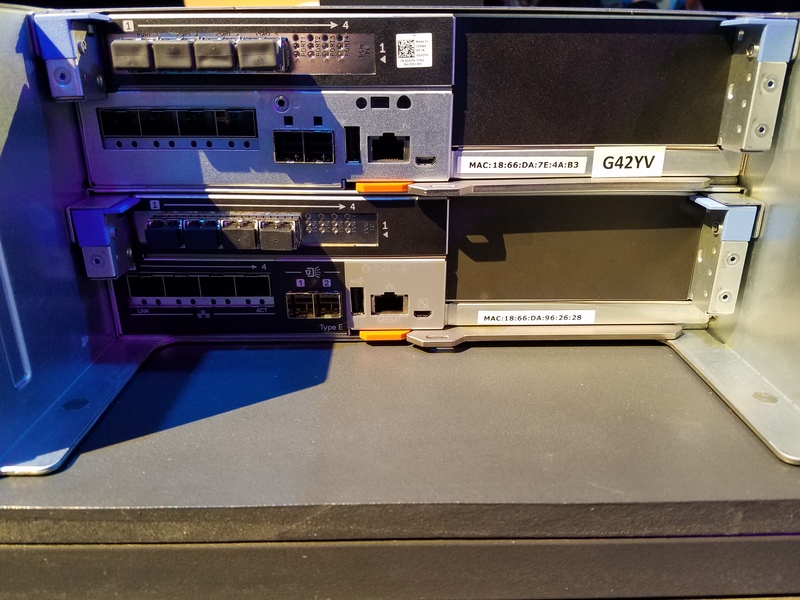 At Dell EMC World 2017 in Las Vegas this week, Dell announced the availability of the SC5020. Its available for quoting any day now, and will start shipping in June 2017. Lowest cost per usable GB of any hybrid array thanks to Dedupe and Compression. The physical hardware packaging is similar to the SC7020 linked above. So, it is a 3U package, which includes 2 controllers and 30 x 2.5″ drives in a single chassis. 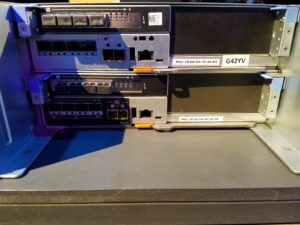 Unlike the SC9000 or SC8000, which are based on the Dell R730/R720 rack mount servers, the SC5020 doesn’t resemble any existing Dell servers. Unlike the SC7020, the SC5020 only gets one expansion slot. The SC7020 has a riser on the right, which you can see is blocked out in the picture below. The system is said to scale up to 2PB, which is a roughly 2x increase over the SC4020. The back of the system looks like this below. You can see the redundant power supplies on the sides, and the controllers are stacked in the middle. You can see where the 3 expansion modules would be below, which are blocked out for the SC5020. 1 Identification LED You can blink this LED from DSM to identify which system is which. 2 Cache to Flash (C2F) This light will normally be off. If its on, it means you are running on battery. 3 Health Status Light This light will do different things depending on the status. When powered up normally, this will be green. When powering up, it will be amber. 4 IO Card Slots These 3 full heigh, half depth PCI slots are where your IO modules go. 5 Serial Port (USB) Pretty much just used in the initial configuration of the box, or if something goes very wrong. 6 Management Port Usual management port connectivity. This is what you’ll point Dell Storage Manager at. 7 USB Port Used for getting phone home type data off the system for dark sites. 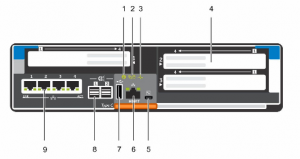 8 SAS Ports Built in SAS ports for drive expansion. You hang disk enclosures off of these. The SC5020 uses the same software as the SC7020, requiring a 7.x version for hardware support. What do you think of this new platform? Let me know below!